This week is moving quickly, Wednesday already! And tonight is our last night of freezing temps for awhile and that’s alright with me. 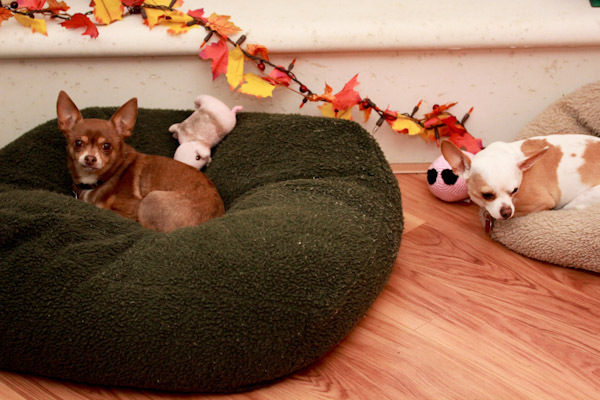 And the chihuahuas too, hopefully they’ll be more willing to go outside! Tonight they’re happy to park it by the fireplace. 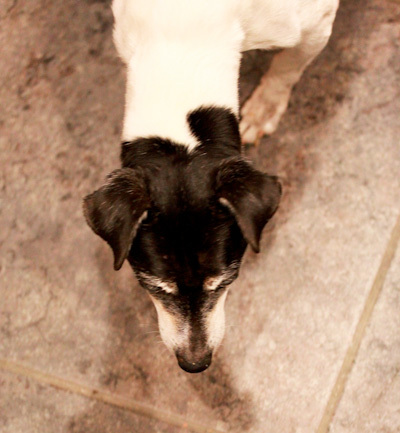 Skipper is happy to thoroughly check the kitchen floor for more food. 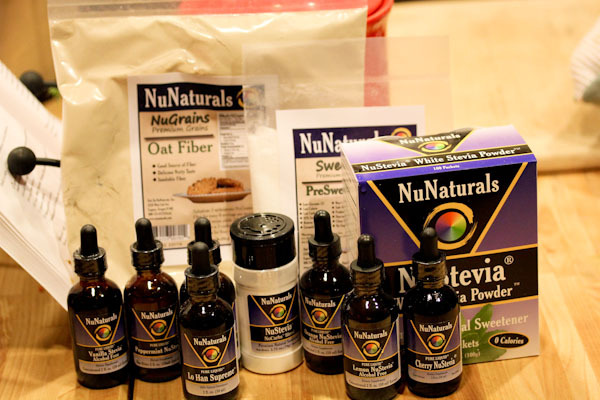 And I’m happy about a huge shipment of NuNaturals Stevia I received to try thanks to NuNaturals, Inc.! There are some exciting new flavors of liquid stevia like the Peppermint NuStevia which I tried in coffee this morning. 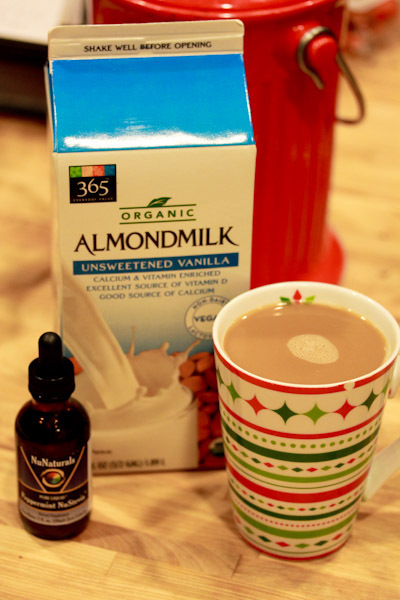 Like peppermint extract, it’s very strong and one drop goes a long way in coffee adding a festive peppermint flavor. I can’t wait to try it in more dessert recipes and will be busy with stevia for the next few weeks! I am still in a one-pot meal kick lately, creating whole foods-based cooked recipes for chilly evenings that skip refined oils or lots of processed ingredients. And quick enough for a weeknight. I bounced this one off a very non-vegan split pea soup recipe, but used split red lentils instead and added more veggies. I also skipped adding oil and caramelizing the leeks first which worked fine, the split lentils took on a similar texture to split peas. 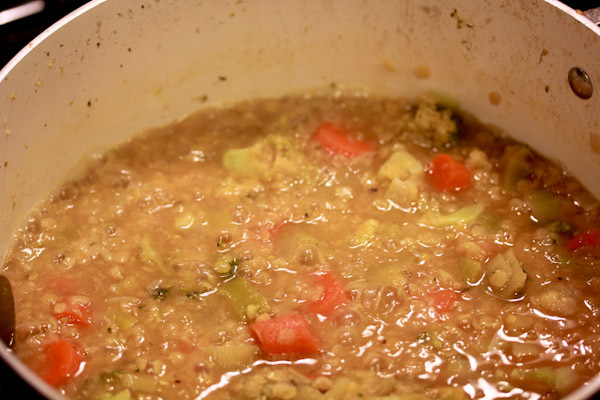 Bring water and lentils to a light boil in a large pot. Reduce heat to a high simmer and add the rest of the ingredients. Cover and simmer for 25 minutes stirring occasionally. Remove the bay leaves, serve, and enjoy. Makes 4 servings. The bay leaves make the kitchen smell wonderful while simmering. The flavor is savory and warming, the bay leaves pair wonderfully with the rosemary adding depth. 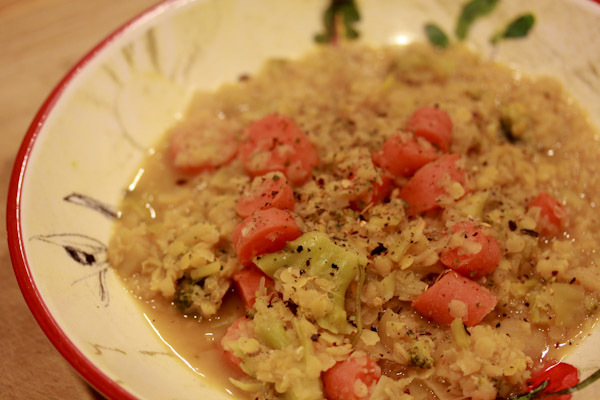 It has the texture of a comforting split pea soup, but with more nutrient dense ingredients. And it’s very filling. Aww poor babies! Hope it gets a bit warmer soon… Lentil soup is always my favorite, especially in the winter! Okay…so…where to begin!? I have lots of thoughts running thru my mind after reading this post! Oh! COLD! Brrrr! yes! It’s 12 degrees here this morning and I don’t think it’s going to get any warmer! BLAH! The chi’s look super cute! That dish looks awesome! I need to do a Quinoa Dish soon because I told my Dad I would save half for him. I want to see if it will help with his digestion issues – Quinoa is supposed to be good for that…but…what I REALLY want to do is play with Lentils MORE lately…I have been craving them! Both are great so maybe I will try and incorporate them both in the same dish soon! Wow on 12 degrees, hang in there! I’m still trying to figure out fun recipes for the stevia, there’s so much to play with! Thanks on the chi’s, how do your’s handle the cold? !